The PDX Art Program is delighted to announce the opening of Archetypal Journeys by Visual Artist Greta Latchford. Latchford’s masterful new exhibition of fourteen strikingly elegant mixed-media artworks are currently on view in Concourse A through March 5th of 2018. Please take a moment while traveling to visit this exciting collection of Latchford’s most recent work (produced in 2017) which are all located past the security checkpoint in the Concourse A corridor display cases. Letting Go of Shoulds, 2017. Stained glass, solder, textiles, copper and grout on birch panel, 25.75 x 36.75 inches framed. Greta Latchford is a Washington based mixed-media artist using innovative techniques to combine stained glass with textiles. Latchford chooses glass and fabric based on texture and tonality to give the work great depth and form. Sophia from Ophir, 2017. Stained glass, textiles, semi-precious stones, solder and grout on birch panel, 48 x 24 inches framed. 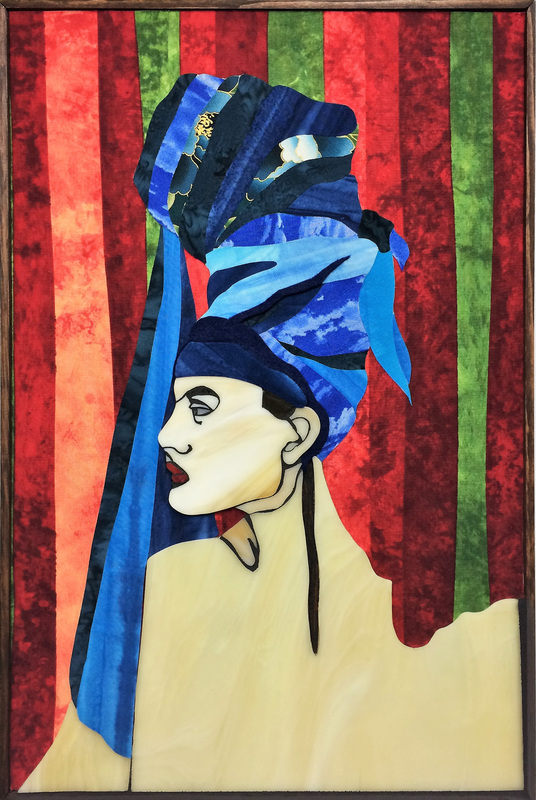 Stained glass, decorative soldering, beading and other mixed media is commonly incorporated into her highly crafted two-dimensional works. Utilizing textiles allows Latchford to create great visual depth within each individual piece. Mami Wata, 2017. 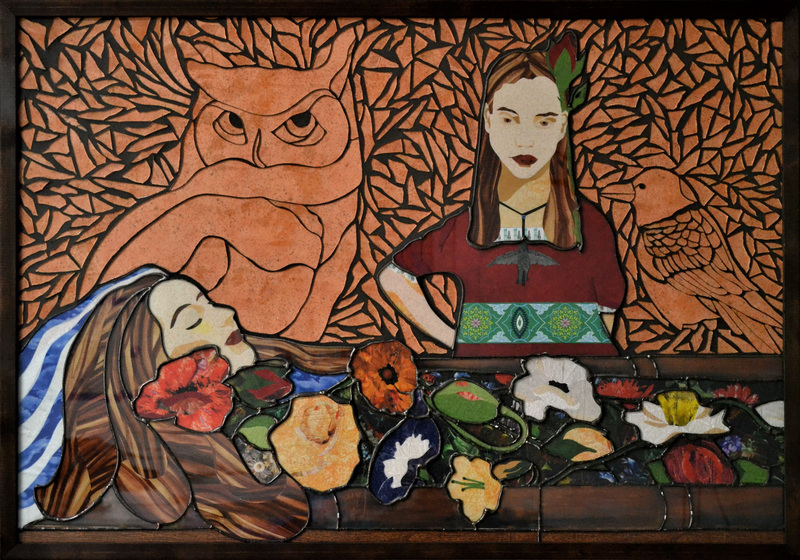 Textiles, stained glass, copper, found objects on birch panel, 43.25 x 22.25 inches framed. Many of Latchford’s works are based loosely on mythological stories and universal archetypes. Through journaling and reflecting, she explores the archetypes operating within her life at any given time. The most powerful ideas become her visual obsession until the initial concept becomes a completed piece of artwork. Multnomah Falls, 2017. Textile and glass collage on birch panel, 33 x 12.5 inches framed. Greta Latchford studied Visual Art and Design in South Carolina at the Greenville Museum School, Fine Arts Center, and Furman University in the late 1980s. She apprenticed with California glass-master Lorn Marshall for eight years before opening her own studio in South Carolina. After moving to the Pacific Northwest in 2005, she became the Port of Portland’s Art Administrator and Curator for PDX. Latchford curated the PDX Art Program until 2016, bringing the work of regional fine artists to the traveling public. Kikimora, 2017. Stained glass, textiles and grout on birch panel, 19.5 x 13 x inches framed. 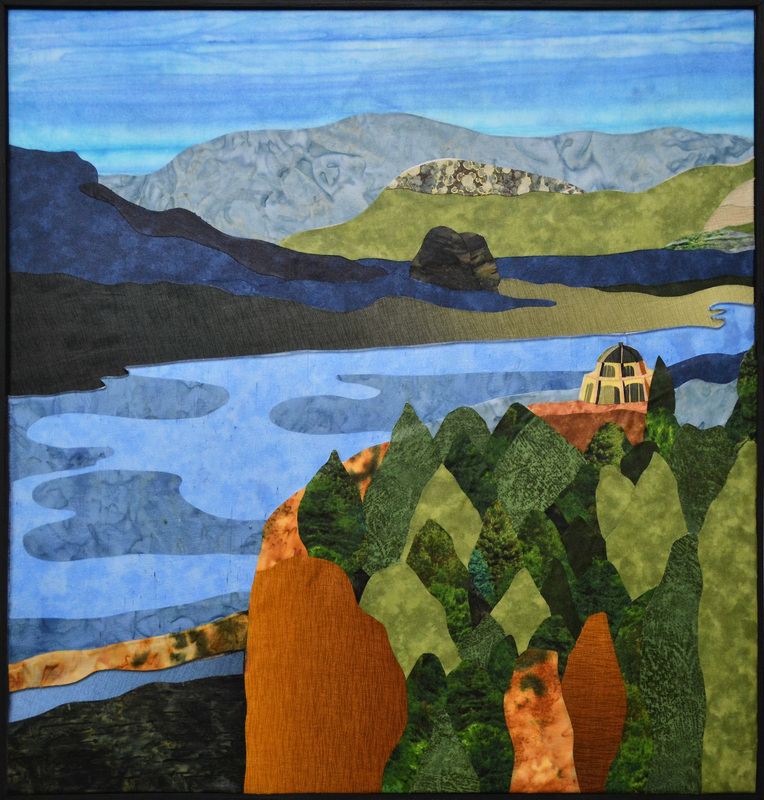 Greta Latchford’s studio is located in Kalama, Washington. For inquiries and additional information please email Greta Latchford at gretaisme@yahoo.com or visit her website at www.glatchford.com. Columbia River Gorge, 2017. Textile and glass collage on birch panel, 23.5 x 24.5 inches framed.